I am SO excited to show you this recipe. 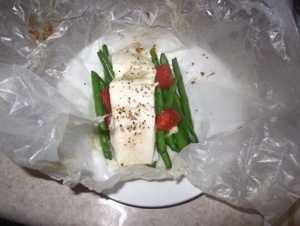 It’s called Fish en Papillote, which means Fish in Parchment. This is an easy, one-pot dish without the pot. It’s light, fresh and unbelievably versatile; a complete show-off recipe that takes very little effort but always gets big applause. As always, I have substitute suggestions and tricks…but you really won’t need much. This dish is harder to pronounce than make! Fish en Papillote is a classic French meal that is perfect for summer. And it only bakes for a little over 10 minutes, so you won’t be running your oven forever on a hot day. It’s all so easy to assemble–this recipe can be doubled or tripled and so on. It’s easy to feed a crowd on this simple dish of fish, fresh veggies and herbs wrapped up in parchment paper (so that they basically steam themselves). Each parchment is an individual serving of fish and veggies. Not only do they all cook well in the steam, but the ingredients also flavor each other and stay incredibly moist. Seriously, perfectly-cooked veggies and fish should not be this easy, but thank Mother Nature they are! Everything is done at once and even comes wrapped up in a cute little present on a plate. It’s an easy and almost effortless way to make everyone at your table feel special. As usual, I have made the recipe as basic as possible so you can get your own creative juices flowing. I am using Halibut tonight. Its meat is firm and its flavor is mild, so it will go with just about anything and it is not a very “fishy” fish. Halibut can get expensive, so I pretty much only buy it fresh when it’s on-sale at a grocery store’s fish counter. Costco has some good prices on it from time to time. 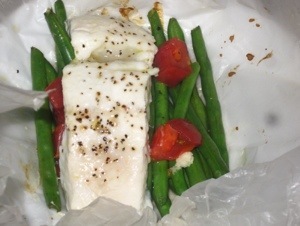 Trader Joe’s has great prices on frozen halibut – definitely cheaper than the fresh prices! As a rule I only buy wild fish, as those that are farmed lack most of the nutrients that make fish such a superfood. It’s a bit more expensive, but not much more. 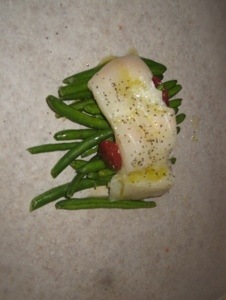 A less-expensive substitute would be snapper or cod, both similar white fish. Tilapia is definitely cheaper. But you can use any fish you like – salmon is fantastic too. Large peeled shrimp would be delish as well. 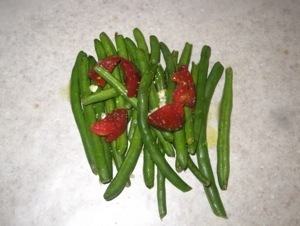 Tonight I chose green beans and heirloom tomatoes. I like to buy the bags of cleaned and ready-to-cook veggies. You can use any veggie or any combination you like. Any color of bell peppers, carrots, broccoli or broccolini, fennel, zucchini – anything goes. You can most definitely add potatoes, however I would slice them pretty thin and maybe par-boil (boil until cooked about halfway) beforehand to make sure they are ready when everything else is. Other herbs like thyme or rosemary or tarragon would be fantastic! Olive oil is my go-to oil. But you can use any kind you like – canola, coconut, etc. Parchment paper is basically wax paper. You can also cook these in the oldskool brown paper lunch bags. Just make sure you brush the bags with some oil so they don’t burn too quickly. The measurement is just a guideline and doesn’t need to be exact – keep your ruler in your desk. All you need to make sure is that the piece is big enough to completely wrap the food in. If you get to the end and realize your paper is too small – not to worry – just tear another piece off and lie it on top the assembled one, then fold up the edges of both together like pinching a pie crust. I didn’t add these to the recipe, but I often slice lemons to put on top of the fish before I cook (sometimes I just wait until its done then add lemon juice). I also like to put one anchovy fillet in the pile. If you are grossed out by anchovies GET OVER IT. You won’t even know it’s there except for the amazing rounded-out, salty flavor it will add. The thin fillets melt right into the food. If you have one of those little convection/toaster ovens this would be an awesome dish to prepare in it. Just make sure the paper is not touching the walls or element. ALWAYS fully preheat your oven. If you don’t, it will often change the outcome of whatever you are making. It needs to be at the temp the food calls for when you put it in. • Take all your veggies and chop them up into thin strips or small bite size pieces. Peel and chop garlic. Set all aside. Things like carrots or fennel need to be thinly sliced or made into shoe strings (thin strips). Things like tomatoes or zucchini can be cut into bite size pieces. No matter what shape, the denser the vegetable the smaller the piece should be so it will cook in time. • Lie out each piece of parchment paper on a flat surface. In the center of each, place some veggies into a neat pile that is slightly wider than your fish fillet. • Sprinkle garlic evenly over each pile. Drizzle with olive oil and season with a good pinch of salt and pepper to taste. Remember we have to season in layers. This ensures that everything tastes good and has a chance to shine. If we don’t season as we go, we won’t be tasting and enjoying the food as much as we could be. The oil adds flavor, moisture and a little bit of fat. This is a very lean dish, but we need a little (good) fat to bring it all home. Don’t skimp the fat – just skip the WRONG fats. • Drizzle olive oil and sprinkle salt and pepper over BOTH sides of your fish fillets. Gently lay one fillet over each pile. Again we need to season that fish! The salt on it and the veggies also helps it cook. 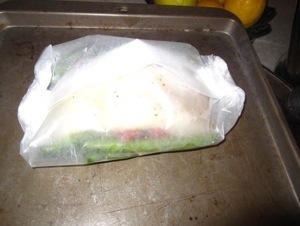 • Fold up the ends of the parchment paper tightly so that the food is totally enclosed leaving a bit of room for the steam. Don’t worry if you don’t fold it into a perfect shape. ALL THAT MATTERS IS THAT YOU LEAVE A LITTLE ROOM FOR STEAM TO EXPAND, BUT NOT ESCAPE. • Bake at 425 for 10 – 12 minutes. Serve immediately. This dish is so easy and so gorgeous! Enjoy the food and the compliments you will get for making it! Thank so much for visiting me this week! I hope you try this or any of my recipes. And if mine don’t work for you, then find some that do. Just try to do what you can. It’s pretty hard to completely change overnight. If you are just starting out, take baby steps – eventually you will get there. Try just cooking one time a week and increase as you go. And I am always here, happy to help answer any questions you have. Thank you for reading my recipe! I have also included a printable version of this recipe here (without all my witty repartee, ha-ha!) I hope you enjoyed it enough to try it! If you have questions or comments feel free to email me at bradymunchblog@yahoo.com! For more of my recipes and commentary, please check out my blog BradyMunch on Word Press! This is a great recipe; I tried it tonight so easy & tasty!